Oil shale crude is actually composed of kerogen. It is a waxy organic substance that was formed from algae, plants, vegetation, and all forms of animal life. Through millions of years, covered in layers of sediment, and subjected to very high pressures a transformation occurred resulting into a form of non-conventional crude oil embedded in layers of sediment. When subjected to very high temperatures it converts into various liquid and gas hydrocarbons. 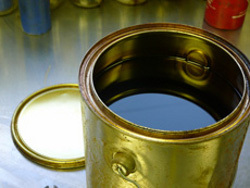 Kerogen can be refined like regular high quality light crude oil.